This entry was posted on Thursday, May 21st, 2015 by Frances Ryan. 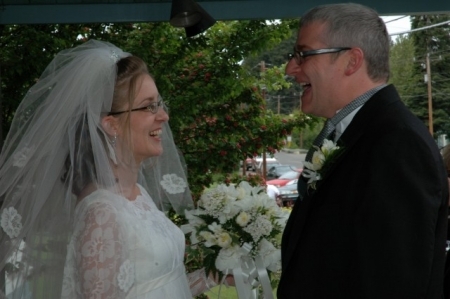 Ten years ago today, I became Mrs Ryan. I stood there at the altar in front of God, family, and friends—with my beloved Paul beside me—and I laughed. Oh, how I laughed. I don’t know what came over me. Nerves, I suppose. And excitement. I mean, I was so excited to be marrying Paul. I was so excited to be starting my life with this wonderful man. I was so excited for the amazing future we had in front of us. And for some reason, the nerves and excitement meant that I began to giggle a bit. And then I began to giggle a bit more. And each time I looked to Paul to help me stop laughing, he smiled lovingly and I started laughing a bit more. So the priest, Father Reilly, had to stop for a moment whilst I tried to compose myself. Paul had to bite his lip and look away from me for fear of joining in with the giggles. And his eldest brother—his best man—had to do everything in his power to not smile at me, knowing that would only make it worse. But I eventually managed to stop laughing, and the ceremony continued. And when Father Reilly put odds on our marriage (well, that’s how we interpreted it) I bit my lip so that I didn’t start laughing again. Though really, the laughter at our wedding was only a sign of what was to come: A marriage filled with more laughter than I could ever have imagined. Way back when, Paul created a couple of short photo videos to share with our family and friends who were unable to attend our wedding, so I thought that I’d share them with you here again. Just in case you want to roll your eyes over how terribly sappy and in love we were. YouTube did not allow me to upload this video with the music Paul had it set to, so the track on the embedded video isn’t as fun. Click here to load the original version. This one loaded with the original music. So no other link needed! Happy anniversary Frances & Paul. The post is truly an inspiration; in memory of the past loved ones, we summon courage to live.